In the beginning, a parachute seems like a mythical creature. It hides in a backpack until you coax it out to burst into a bloom of bright color and save your life. It’s a wing, gliding you safely back down to Earth. And it’s a well-known fact that packing it ain’t easy. How do you pack a parachute so it works right – every time? That, dear reader, is both an art and a science. When you pack a parachute, whether you’re doing it for yourself or someone else entirely, you’re taking on a challenge with a pretty invested consequence. 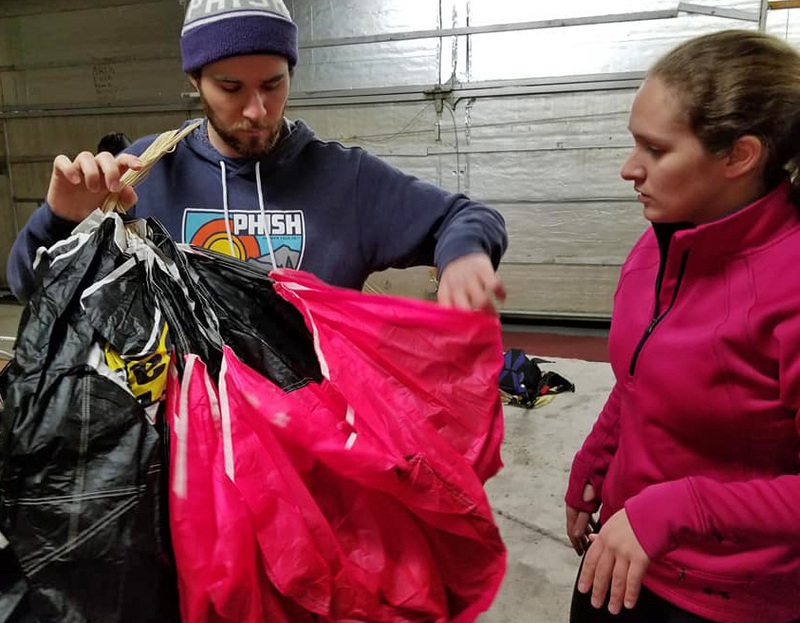 Because parachute packing is such an important part of the skydiving process, we teach parachute packing in great detail at WNY Skydiving. We make sure each student knows exactly what she’s doing and has earned enormous confidence in her skills before jumping her own “pack job.” That said: when you learn to skydive, you can be assured that you’ll be packing your own parachute perhaps-surprisingly early on in your skydiving career. What’s Involved in Packing a Parachute? It’s like folding laundry — on steroids. The actual process of packing a parachute is essentially the act of folding the parachute material and its attachment lines back into the container from which it was deployed. When skydiving was invented and parachutes were round, the packing process didn’t really have much effect on how the parachute opened when it was deployed. As long as it was packed into its container and not seriously tangled, the skydiver could count on a reasonable opening. Cut to modern times. Today’s skydivers use much more advanced parachutes. They’re rectangular, for one thing, which allows for great flying but requires that one side of the parachute open in a certain direction after deployment. That makes the packing quite a bit more involved and makes packing mistakes much more obvious and detrimental. It’s true that the packer can’t be held entirely responsible for the precise way the parachute comes out of its deployment bag (in a multifactorial environment while the jumper is falling at 120mph, more-or-less). But the packer does have to do a few things to give that parachute the best possible chance of opening without any bell-ringing or spin-whooshing issues. The method for packing these parachutes is called PRO packing. “PRO” stands for “proper ram-air orientation.” That tells you quite a bit about the goal of proper parachute packing, right? The “ram-air” thing refers to the design of the modern, square parachute, in which the parachute inflates to rigidity via a series of inlets along the front edge into which air is ‘rammed’ during flight). When we ‘PRO’ pack, we’re folding the parachute in the container in the best orientation for it to fill with air as soon as it’s deployed. 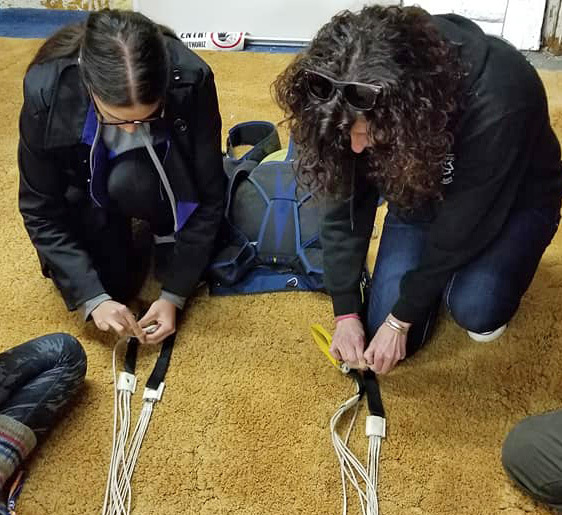 Correctly stowing the lines of the parachute – the strings that connect wing to jumper – is also, predictably, super important. We use special elastic bands to hold the lines in place, which reduces the chance of them being tangled on deployment. It can take new packers ages to do the deed: somewhere around half an hour, usually. It doesn’t take long though before that timeline tightens up significantly. Professional packers can throw together a sport rig in 3-5 minutes. And most sport jumpers get it down to under 10, depending on how much social balderdash they’re shooting with the other jumpers in the hangar. As a newbie skydiver, do I have to pack my own parachute? If no, who does the parachute packing for me? If you’re just starting out learning to skydive (or if you’re joining us for a tandem jump), don’t freak out. You won’t pack your own parachute. A member of our highly experienced (and fully certified) parachute packing team will take care of that. These riggers are awesome people, all of whom are themselves avid skydivers. If you decide to learn to skydive, however, take note: you won’t be able to earn a license until you learn to pack. Once you have that license, you can opt in or opt out. Sport skydivers can choose to pack their own parachutes or pay a packer to do the honors (and yupp – as a full-service training center, we have a dedicated rigging team that can help you with all your rigging needs). How Can I Learn to Pack a Parachute? 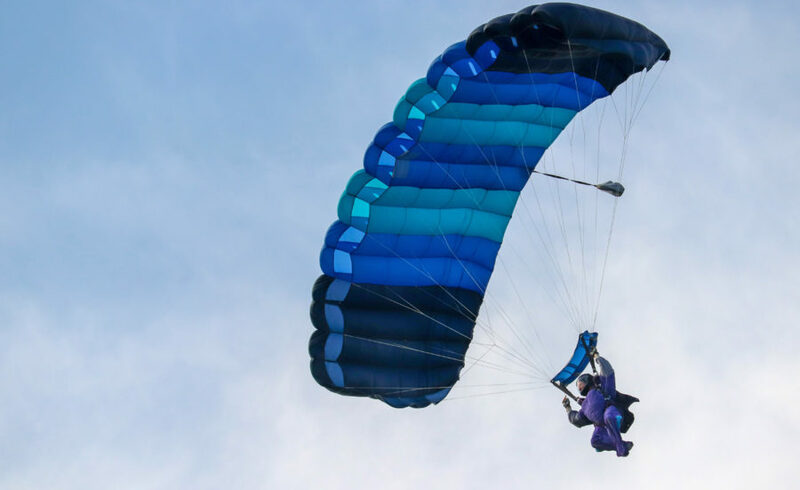 On May 18th, we’re holding a free skydiving parachute packing class at WNY Skydiving! If you’re over 18 and you want to learn more about skydiving, you should definitely take advantage of this class. You DO NOT need any prior skydiving experience in order to participate in this course! And there’s no better way to become familiar with your gear than by hands-on packing. Register today! If you’ve already done a tandem jump and want to learn how to skydive, we have a smokin’ deal that combines the First Jump Course and a parachute packing course for only $150. Either way you want to go – we’re looking forward to seeing you at the dropzone!